Kirsten Moore-Towers and Michael Marinaro perform their Short Program at the 2019 Four Continents Figure Skating Championships. 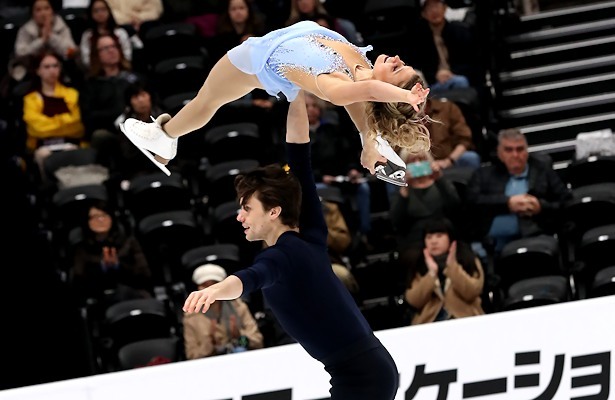 Canada’s Kirsten Moore-Towers and Michael Marinaro took the lead in the Pairs Short Program at the 2019 Four Continents Figure Skating Championships on Friday afternoon. China’s Wenjing Sui and Cong Han and Cheng Peng and Yang Jin are currently in second and third, respectively. Moore-Towers and Michael Marinaro showed marked improvement in their connection to “The First Time Ever I Saw Your Face.” The 2019 Canadian national champions delivered a level 3 triple twist, solid side-by-side triple toes and throw triple loop. The team also earned level 4 on the spin and footwork for a new season’s best of 74.66, topping their score from 2018 Skate Canada where they won bronze. In their first appearance this season, Sui and Han performed to “No One Like You,” executing a solid level 4 triple twist and throw triple flip, however, she fell on side-by-side triple toes. The 2018 Olympic silver medalists earned a level 4 on their spin and footwork to score 74.19 points. The four-time Four Continents champions had withdrawn from both their Grand Prix events, as well as nationals, due to an ongoing injury on Sui’s right foot which forced the team to withdraw from Worlds last year. Teammates Peng and Jin had a fall on the throw triple loop, but otherwise showed a level 3 triple twist, solid side-by-side triple toes and level 4 footwork and lift in their routine to “Ophelia.” The 2018-19 Grand Prix Final silver medalists earned 69.48 points. USA’s Ashley Cain and Timothy LeDuc showed lots of character in their jazzy routine to “Bella Belle” which featured side-by-side triple loops, a level 2 triple twist and throw triple flip. The defending silver medalists earned a new season’s best of 67.49 for fourth place. “We really want to be on the podium, but we also want to put out two strong performances backing up our nationals performance to show we are here to play,” said Cain of their goals. “We hold ourselves to a really high standard, so we’re going to try and do a clean performance tomorrow. We know coming in to this that we’re trained and we can do all of these elements pretty easily. “We did a fist pump after the program because we were really pleased with the effort we put out today,” explained LeDuc. Cain had suffered a concussion from a lift at Golden Spin of Zagreb in December. Teammates Tarah Kayne and Danny O’Shea put out a soft but strong routine to “Turning Page” which featured a good throw triple loop, level 4 spin and footwork, however, she turned out the landing on the side-by-side triple Salchows. Despite the mistake, the defending champions scored a season’s best of 66.34, improving from 2018 Internationaux de France where they won silver. Evelyn Walsh and Trennt Michaud of Canada showed some heat in their routine to “Come Together.” The 2019 Canadian national silver medalists landed solid triple toes, a throw triple loop and level 4 lift for a new season’s best of 61.91, besting their score from 2018 Skate Canada and breaking the 60-point mark. The are currently in sixth place. USA’s Haven Denney and Brandon Frazier sit in seventh (61.71) after Denney underrotated and two-footed the landing on the side-by-side triple Salchows. However, the 2018 Autumn Classic bronze medalists showed a level 3 twist, throw triple loop and level 4 lift in their “Billy Jean” routine. Canada’s Camille Ruest and Drew Wolfe had a low catch on their triple twist and she fell on the side-by-side triple toes she fell, but the 2019 Canadian national bronze medalists landed a throw triple loop and earned a level 4 on their lift, footwork and spin in their “Wild Horses.” They round out the eight-team field with 57.38 points.